This group will tell you all you need to know about Teton County’s handful of fabulous golf courses. JACKSON HOLE, WY – The brand new, dark blue Chevy Suburban pulled up to the bag drop outside the Shooting Star pro shop in Teton Village. At the wheel was Luther Brookings, a member at 3 Creek Ranch, a private golf development on the outskirts of Town of Jackson that features a Rees Jones golf course. In the passenger seat was Bill Frumkin, his college buddy and lifelong friend from Chattanooga, Tennessee, and a member at Snake River Sporting Club. Almost before Luther shifted the Chevy to park, Andy Jackson had popped the rear doors and began removing the golf bags. Andy had been wrangling carts and caddying at Shooting Star since the Tom Fazio design opened for play in July 2009. In fact, Andy would soon clock out and don a white jumpsuit in time to join this group as a forecaddie on this azure August afternoon with light winds, no humidity and temperatures in the mid 70s. Best. Weather. On. Earth. Andy recognized both men from previous visits, addressing them by name, as the pair often played as guests of members. They were here on their own on this Tuesday, however, when Teton County residents are welcome to pay a green fee and access the otherwise private course, per an agreement during the lengthy county approval process for Shooting Star. It wasn’t easy pushing through Jackson Hole’s largest residential developments in recent decades and a major addition to the once sleepy hamlet at the base of Jackson Hole Mountain Resort. A valet whisked away the Suburban as both men ambled into the pro shop and toward the practice facility (don’t call it a driving range at a club this nice) for a few swings before their 2:30 tee time. Already at the range was Jim Nelson and Steve Black, another pair of longtime friends and Jackson Hole locals since the 70s. Jim is a member at Teton Pines and Steve belongs to Jackson Hole Golf & Tennis, a Robert Trent Jones design near Jackson Hole Airport that is the valley’s oldest course. Jim and Steve had been there for about 45 minutes, enjoying hitting brand new Titleist Pro V1s that hung in the air in front of the Grand Teton. Jim and Steve’s home courses have space-constricted driving ranges with limited-flight balls as enjoyable to hit as chunks of granite chiseled from the surrounding hills, so they arrived early to enjoy the premium practice time. The facilities here, just as at 3 Creek Ranch, feature multiple putting greens and short-game practice areas, a double-ended range and top-notch instruction. While also a private course, Snake River Sporting Club’s practice area is more limited, though it does offer “real” golf balls. By the time Luther and Bill pulled up to the practice facility, two foursomes of couples and their caddies were loading up their carts and heading for the first tee. “Looks like we’re in for a slow round,” said Bill, who felt a round of golf played at anything slower than a canter to be eternal, before grabbing a wedge, 7-iron, hybrid and a driver from his bag. “Oh well, may as well take our time, get our money’s worth,” said Luther, who did not really worry about getting the most out of today’s greens fee after paying more than $100,000 to join 3 Creek Ranch. Shooting Star’s golf membership also requires more than six figures to get a locker. Memberships at Golf & Tennis and Teton Pines are comparative bargains at much closer to $10,000, but members at those courses must share with the public after noon, not to mention numerous outings, tournaments and other golf events. Snake River Sporting Club, a private course, is priced in the middle – high enough to keep the course reserved for members and guests but low enough to convince potential members to drive the half hour south from Town of Jackson to deep in the heart of the Snake River Canyon. SRSC also offers affordable associate member programs for those already a member at one of the valley’s four other courses. While warming up, the four local members introduced themselves and decided it would be best to play as a foursome, considering the potential slowness of the groups that were currently meandering toward the first green. At that moment, the starter and Andy, the outside service employee turned caddie, arrived to help them get their clubs back on the carts and toward the course. Caddies are required of unaccompanied guests at Shooting Star, a service some players resent because of the cost but almost all ultimately appreciate. After all, it’s pretty darn nice having someone get your every yardage, clean your clubs after every shot, fix ball marks, rake sand traps, point out ski lines down the looming mountainside, and tell old golf jokes. 3 Creek Ranch has a similar system, offering professional caddies to members upon request and insisting on them for unaccompanied guests. Teton Pines once had a very vibrant caddie program, now mostly dissolved, that peaked in the 1990s, though it was more focused on employing local teens that were paid in part with playing privileges. Snake River Sporting Club also offers caddies upon request, but the program is still gaining momentum under new management. Finally, it was time to tee it high and let it fly. Jim, the low-handicapper in the group, led things off with a low, piercing draw that traveled 295 yards before coming to rest just 90 yards from the green. Steve, also a strong player capable of breaking 80, hit as fine a shot but slightly left and into a fairway bunker. Bill and Luther both pushed their shots to the right, coming to rest in the thin fescue ubiquitous beyond the manicured fairways of Shooting Star. 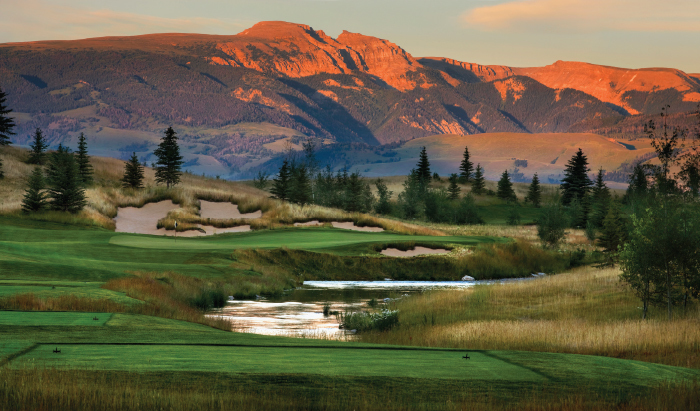 All five of Jackson Hole’s golf courses begin with a manageable par 4 designed to provide a good chance to start the round with a par or better. At Shooting Star, Tom Fazio’s trademark bunkers with more bark than bite appear to be unavoidable from the tee and the green is only one of two on the course not visible from the tee, but the fairway is indeed fair and wide and the green as flat as any in the valley. Beyond that first tee shot, however, each course quickly establishes its own personality. Perhaps most distinctive is Snake River Sporting Club, which opened for play in 2006 after a very contentious approval process of its own and reopened in 2014 after its second bankruptcy halted play for four seasons. The Tom Weiskopf design winds its way along the base of a mountain, through a conifer forest and along the river bottom just yards from the Snake River. At no other course is your score likely to skyrocket as quickly, with dense weeds lying in wait just beyond the tight fairways and insidious greens. It’s long, yes, at 7,533 yards, but its tree-lined front nine often keeps the driver in the bag and demands accurate mid-iron play. 3 Creek Ranch also moves between different ecosystems, with the first six holes traversing some of the finest trout streams in the valley and among the tall cottonwoods that thrive on river bottomland. From there it climbs (albeit very slightly) back to the sagebrush flats and open spaces that describe much of Jackson Hole for eight holes, which are distinguished primarily by creative berming, man-made water features and challenging but could-be-anywhere holes. The course ends, however, with four holes that provide the greatest views and elevation changes among the valley courses as it meanders atop one of the buttes surrounding the town of Jackson area. Perhaps most comparable in layout and style are the valley’s two oldest courses: Teton Pines, designed by Arnold Palmer and Ed Seay in the late 80s, and Jackson Hole Golf & Tennis, which was the valley’s first course and began play in the late 60s. Both are easily the most walkable courses with no elevation change and greens and tees in close proximity. Both also weave through platted subdivisions designed to have as many single-family homes as possible along the fairways. While the bunkers at each course have been enhanced in number, size and visual profile in the last 10 years, they still reveal a basic design philosophy now mostly abandoned that traps exist to provide a relatively minor penalty for wayward shots, not to visually intimidate and deliver a life sentence to those who err ever so slightly. Separating Jackson Hole Golf & Tennis from all valley courses, however, are the in-your-face views of the Teton Range. Both back-nine par 3s offer postcard moments with shots hit right at one of the Cathedral Peaks. Its location at the center of Jackson’s “hole” – the flatlands at the center of this valley surrounded by three mountain ranges – allows for panoramic mountain views that go on and on. As the foursome contemplated their second shots on the par-5 ninth hole, the Shooting Star clubhouse, and the surrounding single-family “cabins” on the other side of a large pond, came into view for the first time in nearly two hours. Thanks to its design as a “core” course, meaning all holes are grouped together, and some comprehensive, fantastically subtle berming on an otherwise flat course, golfers see nothing but golf course and distant vistas while navigating the layout. Luther, who hit the shortest drive, laid up short of the green with acrisp six iron. It was not only unfeasible for him to reach the green, the play was in line with his severely conservative style of golf (and politics). If he could plod his way to a par he would break 40 on the front nine, a rare feat for the 68-year-old in recent years. Bill and Steve were more aggressive, wildly launching hybrid club shots at the green that both came to rest in the large bunker guarding the front of the green. Jim, however, after a big drive that left just 175 yards to the green, drew a seven iron onto the middle of the green, setting up a 20-foot eagle putt. “Nicely done, Jim!” Luther said heartily. The two had hit it off during the round, already planning to play together the following week at Teton Pines. After holing out – Jim missed the eagle putt, settling for birdie and a front nine score of 38, and Luther got his par – Andy led them to the Shooting Star snack bar. Steve ordered a hot dog and a beer to go from the limited lunch menu, while the others passed on any refreshments, having snacked on complimentary goodies along the way. While each course will keep you fed one way or the other during a round of golf with predictable sandwiches, hot dogs, power drinks and candy bars most really shine when it comes to fine dining. The private dining rooms at 3 Creek and Shooting Star are staffed by top chefs and highly regarded, though enjoyed only by members and guests. Teton Pines, which is open to the public, has garnered a reputation as one of the finest restaurants in all of Jackson Hole, golf course or not. The Grille at Golf & Tennis is as scenic a dining room as there is, which is why it hosts so many weddings each summer. The group found its rhythm on the back nine, as did the groups in front of them. With 10 groups on the course it was a busy afternoon for Shooting Star, but the spacing and pace were as pleasant as the weather. The days had become noticeably shorter, with dusk coming even earlier to Shooting Star than the rest of the valley due to its location at the base of the east-facing slopes of the Tetons. As Luther teed up his ball on the 18th hole, Andy took his position to the right of the tee marker and in front of the group. The finishing hole was one of Jackson Hole’s most challenging, a long, dogleg left par four that requires a drive from these tees to carry at least 230 yards to stay dry, more to clear the gaping bunker if an aggressive line is taken. The last rays of the day shone over their shoulders, illuminating the group with flattering light and the distant mountains with a pastel alpenglow. The group was tired but buoyant with the camaraderie and friendship that comes from sharing the ups and downs of a round of golf on a beautiful day, no matter where the course happens to be. “Just beautiful,” said Bill, whose inherent impatience had faded even before the group began the back nine. “I’ll say, unless you’re talking about my play over the last few holes,” said Steve. “That’s no joke,” teased Jim, who despite having a chance to break 80 with a par on the last had already lost the team bet badly thanks to Steve’s streak of double-bogeys. A big part of the Jackson Hole golf scene is in a completely different state. After cresting Teton Pass, which marks the southern end of the Teton Range, and crossing the state border with Idaho, five more distinctive golf courses all are just a few minutes away. A change in state of mind also occurs, with courses on the opposite side of the Tetons decidedly more affordable, accessible and relaxed overall. Headwaters Golf Club at Teton Springs is the course closest to the state line with drive time from Wilson easily less than 30 minutes. The course was designed by the triumverate of Byron Nelson, Steve Jones and Gary Stephenson and opened in 2004. The course is private, but allows a set number of non-member groups per day. Teton Reserve is just a bit further along in Idaho, located about three miles west of Victor. The Reserve is best described as the best public course in the region as it is open to all and the rates are very reasonable. At one time, the Hale Irwin design had hopes of being one of the region’s premier golf neighborhoods, but the recession interrupted construction. 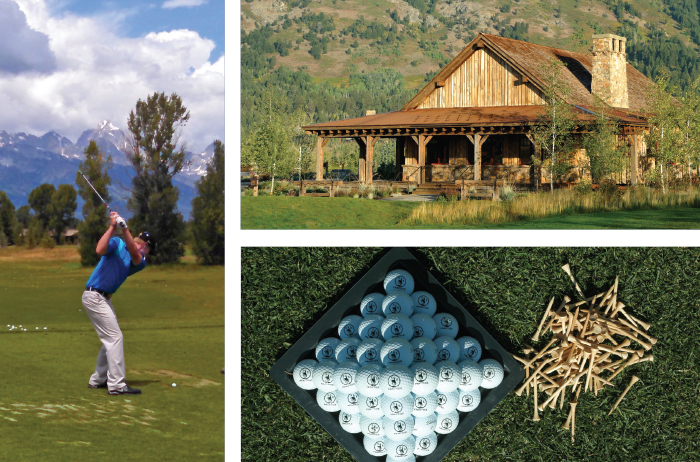 For golfers on a budget in Jackson Hole and Teton Valley, that turned out to be a good thing. Targhee Village Golf Course was for many years Teton Valley’s only golf course, an open 9-hole layout perfect for beginners and fun for better players. Today there are two more holes and a better practice range but the rates remain very affordable. The course is technically in Wyoming, located just over Stateline Road and to the east of Driggs. 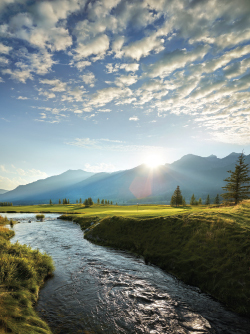 Huntsman Springs, a nationally ranked jewel of a course located in downtown Driggs, is Teton Valley’s sole completely private course and community. Designed by David McLay Kidd and opened in 2010, it is a rolling challenge lined with water and tall native grasses meant to remind of Old World courses. 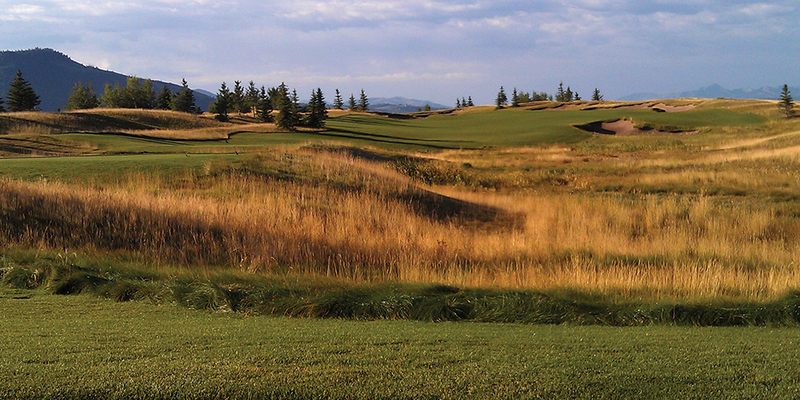 The Links at Teton Peaks were born of one man’s dreams to turn his backyard into a golf course, with no intention of selling real estate or getting rich selling greens fees. Bob Wilson opened what was then just nine holes in 1999, offering Teton Valley a second option for golf. Since then a second nine has been added, Wilson sold the property to a company that manages another course in Idaho Falls, and the loyal following of players has only grown.